Aghoris are simple beings or beings who live with complete simplicity. Today, we have complicated religion to a very large extent. We perform rituals, ceremonies and practice techniques in a roundabout way to achieve health and wealth. But I tell you, religion is not meant just for health and wellness. Its main purpose is to help you break your negative mental patterns and achieve the ultimate. Health and wellness should only be a by-product. Aghoris directly work on breaking these patterns and simplifying religion. They don’t do things in a roundabout way. Aghoris are not dream sellers. Anybody who sells you a technique and asks you to go on practicing it, assuring you that one day God will give you enlightenment, is a dream seller. I always tell people to work with unclutching for just 10 days. If it works, it works, otherwise forget about it. In 10 days itself, you will see a major breakthrough. When you experience the breakthrough, you are growing. If you tell an Aghori that God is all powerful and if you pray to him he will come and bless you, he will simply laugh at you. Like I said, Aghoris are not dream sellers. Aghoris can often seem like nightmares. They are embodiments of Lord Shiva walking on the planet, trying to wake people up. If you are too attached to life, then even the very sight of an Aghori will frighten you. Today, I see how people have lost connection with simplicity. Everything is seen with perversion. Aghoris are a tradition who are straightforward and simple. They are the embodiment of simplicity. Their way of thinking is beautiful, simple, innocent and straightforward. An Aghori will directly work on his patterns. If an Aghori carries hatred towards something, he will eat what he hates. If he has any violence in him, he will learn to love that violence in order to let go of it. If he loves something and thinks it’s binding him, he will immediately throw it away. They don’t believe in gradual liberation by letting go of an object mentally but keeping it with them physically. They let go of everything they like and expose all their five senses to what they hate. If an Aghori has a blockage in his heart then he will open his heart, clear the blockage, and then stitch it back. They don’t even bother taking anaesthesia. And yet, they know exactly how to treat the blockage. They go into the depths of fear and face it, to the depths of hatred and let go of it, to the depths of suffering and come out of it, to the depths of pain and go beyond it. When an Aghori can’t wake up in the morning, he simply stops sleeping. They do not postpone things. This is the attitude of an Aghori. No other sampradaya (tradition) expressed as many extraordinary experiences and strong enlightenment experiences as Aghoris did. 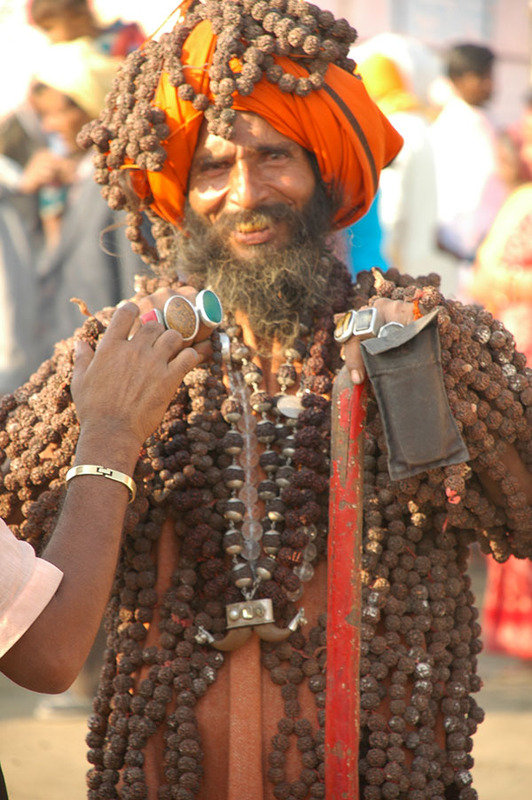 Aghoris are often projected as India’s wrong side by many people, or the side that needs to be covered up. As the only Aghori who is in the world’s most influential 100 Gurus, who is courageously boldly associating himself with Aghori sampradaya, I tell you Aghoris are the pride of India, they are the pride of Vedic tradition. When I was in college, I used to wake up at 4 A.M. in the morning and meditate till 8 A.M. in padmasana (yogic posture). My roommates started to shiver after watching me meditate. They started to move out of the room because of me and spreading rumours that I was a yogi and they should stay away from me or else I would curse them. I asked them why they called me a yogi when I didn’t even express any extraordinary power. They said “If you are not a yogi, how are you able to sit from 4 to 8 in the morning without moving?”. This shocked me. I could not understand how they found this unusual. Later, when I started contemplating about this,I realized that even sitting is a difficult task. Humans are hypnotized by the concept of conscious, subconscious and all this nonsense. Human civilization has already made you believe something before you actually tried it. When you have so much dirt inside, how do you expect to sit peacefully? Aghori sampradaya can flourish only in a civilization where this nonsense of unconscious and subconscious is not taught. You are an integrated individual. What you want, you achieve, that’s all. This is the basis of the Aghori sampradaya. Unfortunately, humanity is not at this zone. I still cannot understand when somebody says, ‘I want to do it, I cannot do it’. That word is the enemy of Aghori sampradaya. The Maha Vaakya ( great declaration) of Aghori sampradaya is “Simply do it”. If you go to an Aghori and tell him how much you fear death, he will simply ask you to go through the death experience itself. But Aghoris never ever interfere in others’ life, never cherish enmity or hatred towards anybody. They are compassionate people, like Shiva. If you go and tell them “Oh I am too attached to my bed, my home, my car”, they will tell you to sleep in the cremation ground, that’s all. The basic requirement for the Aghori Sampradaya is the clarity that you are an individual integrated being – what you want, your body does. What you want your mind does, what you want you do! Meditate on this three words and do it ! Previous articleInner Awakening: The Quantum Leap!